Please fill out our Online Draw Request Form – available here. Ensure you note how the inspector can gain access to the property. If this is a final inspection, please note this under the description section. Typically it takes the inspector 48 hours to inspect and write up the inspection report. Once we have the inspection report back we will deposit the money into your account via ACH. If you have any questions don’t hesitate to call us at 214-420-7330 or email at draws@longhorninvestments.com. Step 2: The borrower is ready to be reimbursed for completed work and submits the Draw Request Form - available here - to the lender. Please provide property access info (i.e. lock box code) and a working phone number so the inspector can call you. Step 3: The inspector calls the borrower to confirm a time and date of the inspection. They must have interior access as well. Step 5: The lender compares what was requested on the Draw Request with what was actually performed at the property. Escrow funds are electronically released from the lender to the borrower. Turnaround time is typically 3-4 business days from the Draw request to the borrower’s receipt of the funds. 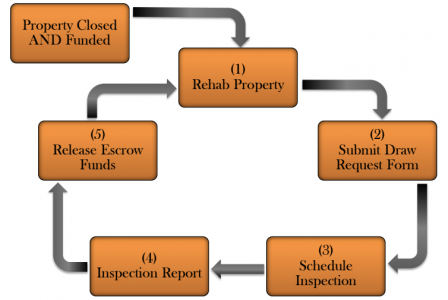 Inspection Fees: Inspection fees range from $100 to $150 and will be deducted from the escrow rehab account. The borrower can request as many or as few inspections as needed. NOTE: Longhorn Investments does not release funds for work that has not been performed, including the start of rehab. If you have any questions don’t hesitate to call us at 214-420-7330 or email us at draws@longhorninvestments.com. I wish all lenders had processors that were this quick. You and your team are awesome!